The vast majority of BullionVault users prefer to keep their bullion safely inside the vault. Fully insured at the lowest costs, it's ready for instant sale at maximum value 24/7. But if you've bought gold on BullionVault, it's your property and you have the right to withdraw it should you choose. 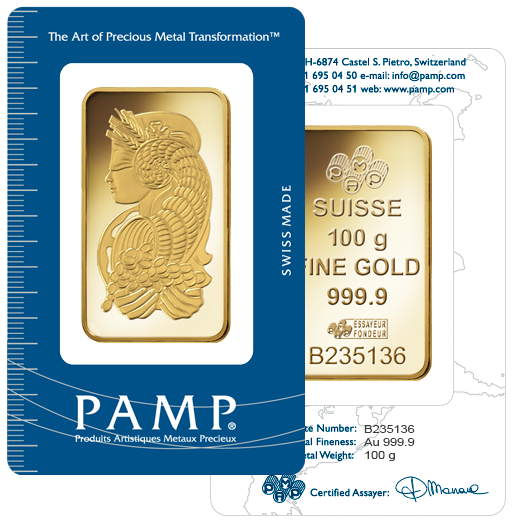 You can now withdraw gold from BullionVault in the form of a Pamp Fortuna 100g bar. If you are an existing customer and already own enough gold in a single vault, you'll pay a fee which depends on where you live. Transport and insurance are included. How can BullionVault offer bars at such value? We invite clients to place their bar orders within a defined window of time (usually a few weeks). We then batch up the orders received during that window and place an order with the bar manufacturer, meaning we do not have to finance stock. We offer a standard bar size from a respected London Bullion Market Association (LBMA) refiner. This process allows us to keep the operational burden to a minimum and keep prices low. You can withdraw bullion from BullionVault in other formats but different rates and processes apply. What do I need to get a gold bar? A BullionVault account validated (identity and ownership of bank account proven) as a personal account - not a business, trust or pension/retirement account. At least 100g gold held in a single vault within your BullionVault account. Enough money in your account to pay for manufacture and insured shipping. Proof of your residential address for shipping. Where will you deliver bars to? We will only deliver to your home address as proven by a recent credit card statement or utility bill. You must not share this address with another residence. We will not deliver to a commercial address. You can request a 100g gold bar withdrawal to these countries. I’m new to BullionVault. Can I still request a bar? upload proof of identity, address and ownership of the bank account used to deposit funds. Standard BullionVault charges to hold and insure gold in the vaults will apply until your gold is withdrawn.